To define these settings go to Options menu, select Global Options, then select the Strategy Setup tab. A list of currently defined strategies will be listed. To add a strategy: enter the name in the Add New Strategy field; click on the Add button to add the new strategy. To remove a defined strategy: select the strategy from the list then click on the Remove button. 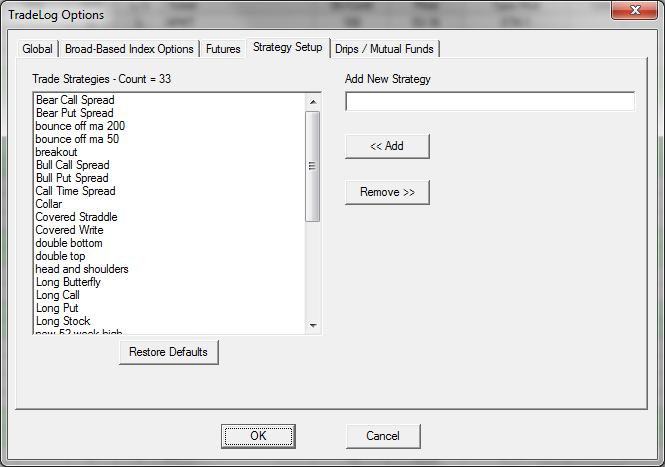 To restore the default list of strategies, click the Restore Defaults button.